Today, the Bill of Rights Commemorative Gold Five-Dollar Coin remembers when the Virginia convention approved the Declaration of Rights written by George Mason on June 12, 1776. George Mason was a member of that convention of Virginia, which, on the fifteenth day of May, 1776, declared that state independent and formed the constitution by which it is still governed. And to him belongs the honor of having drafted the first declaration of rights ever adopted in America, of which the following is a copy. The few alterations made by the convention, which adopted it unanimously on the twelfth day of June, 1776, and made it a part of the constitution of Virginia, where it yet remains, are noted. This declaration contains principles more extensive, and much more perspicuously expressed than any then to be found in the supposed analogous instruments of any other age or country. The English Magna Carta was, strictly speaking, a contract between an assemblage of feudal lords and a king, not a declaration of the rights of man, and the fundamental principles on which all government should rest. The articles drawn up by the Spanish junta, in the year 1522, under the guidance of the celebrated Padilly, are much more distinct and popular in their provisions than those of the English Magna Carta. But, although it is admitted, that the principles of liberty were ably defended, and better understood, at that time in Spain, than they were for more than a century after, in England, the power of Charles 5th proved to be irresistible, the people failed in their attempt to bridle his prerogative, and their liberties were finally crushed. The famous English bill of rights sanctioned by William and Mary on their ascending the throne, and which, under the name of the petition of rights, appears to have been projected many years before by that profound lawyer, sir Edward Coke, like Magna Carta, and the articles of the Spanish junta, is a contract with nobility and royalty, a compromise with despotism, in which the voice of the people is heard in a tone of disturbed supplication and prayer. But in this declaration of Mason’s, man seems to stand erect in all the majesty of his nature —to assert the inalienable rights and equality with which he has been endowed by his Creator, and to declare the fundamental principles by which all rulers should be controlled, and on which all governments should rest. The contrast is striking, the difference prodigious. And when I read, at the foot of this curious original, the assertion of its author, that “This Declaration of Rights was the first in America;” I see a manly mind indulging its feelings under a consciousness of having done an act so permanently and extensively useful. And what feeling can be so exquisitely delightful? what pride more truly virtuous and noble? The principles of liberty filled and warmed the bosom of this venerable patriot in that last hour, which is an awful, and an honest one to us all; in his last will, he speaks in his dying hour, and charges his sons, on a father’s blessing, to be true to freedom and their country. He was indeed and in truth one of the fathers of this nation. Therefore, let every son of free America, as he enters upon the busy scenes of life, hear and solemnly beseech Heaven to fortify him in the faithful observance of this sacred charge of one of the most worthy fathers of this country. A declaration of rights made by the representatives of the good people of Virginia, assembled in full and free convention; which rights do pertain to them and their posterity, as the basis and foundation of government, unanimously adopted by the convention of Virginia, June 12th, 1776. That all men are created equally free and independent, and have certain inherent natural rights of which, they cannot, by any compact, deprive, or divest their posterity; (^) among which are the enjoyment of life and liberty, with the means of acquiring and possessing property, and pursuing and obtaining happiness and safety. That all power is by God and nature vested in and consequently derived from the people; that magistrates are their trustees and servants, and at all times amenable to them. That government is, or ought to be, instituted for the common benefit, protection and security of the people, nation or community. Of all the various modes and forms of government, that is best, which is capable of producing the greatest degree of happiness and safety, and is most effectually secured against the danger of administration; and that whenever any government shall be found inadequate or contrary to these purposes, a majority of the community hath an indubitable, unalienable indefeasible right, to reform, alter, or abolish it, in such manner as shall be judged most conducive to the public weal. That no man, or set of men, are entitled to exclusive or separate emoluments or privileges from the community, but in consideration of public services; which not being descendible, neither ought the offices of magistrate, legislator, or judge, to be hereditary. That elections of members, to serve as representatives of the people in the legislature, ought to be free, and that all men having sufficient evidence of permanent common interest with, and attachment to the community, have the right of suffrage; and cannot be taxed, or deprived of their property for public uses without their own consent, or that of their representatives so elected, nor bound by any law to which they have not, in like manner, assented for the common good. That all power of suspending laws, or the execution of laws, by any authority, without consent of the representatives of the people, is injurious to their rights, and ought not to be exercised. That in all capital or criminal prosecutions, a man hath a right to demand the cause and nature of his accusation, to be confronted with the accusers and witnesses, to call for evidence in his favor, and to a speedy trial by an impartial jury of his vicinage, without unanimous consent he cannot be found guilty, nor can he be compelled to give evidence against himself; and that no man be deprived of his liberty, except by the law of the land, or the judgment of his peers. That excessive bail ought not to be required, nor excessive fines imposed, nor cruel and unusual punishments inflicted. That in controversies respecting property, and in suits between man and man, the ancient trial by jury is preferable to any other, and ought to be held sacred. That the freedom of the press is one of the great bulwarks of liberty, and can never be restrained but by despotic governments. That a well regulated militia, composed of the body of the people trained to arms, is the proper, natural, and safe defense of a free state; that standing armies in time of peace, should be avoided, as dangerous to liberty; and that, in all cases, the military should be under strict subordination to, and governed by the civil power. That no free government, or the blessing of liberty, can be preserved to any people, but by a firm adherence to justice, moderation, temperance, frugality and virtue, and by frequent recurrence to fundamental principles. That religion, or the duty which we owe to our Creator, and the manner of discharging it, can be directed only by reason and conviction, not by force or violence, and, therefore that all men should enjoy the fullest toleration in the exercise of religion, according to the dictates of conscience, unpunished and unrestrained by the magistrate, unless under color of religion, any man disturb the peace, the happiness, or the safety of society. And that it is the mutual duty of all to practice Christian forbearance, love, and charity toward each other. The foregoing was copied verbatim from the original, the hand-writing of the author, col. George Mason, of Virginia, left in the possession of his son, gen. John Mason of Georgetown. In order to facilitate the comparison of it with that which was adopted by the convention, and is still in force, it has been thought proper to number the articles as in the adopted declaration, omitting the tenth and fourteenth which were inserted entire by the convention; and to place those words in italics, which were either expunged or altered, and to put a caret where others were added. 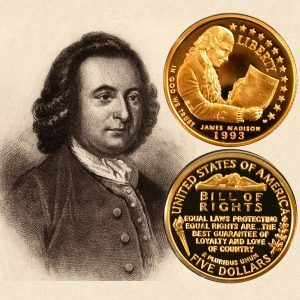 The Bill of Rights Commemorative Gold Five-Dollar Coin shows with an image of a portrait of George Mason held by his family.